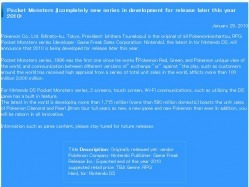 in the picture taken from www.pokemon.co.jp the creator of pokemon says that a new pokemon is comming 2010. he says that its for the nintendo ds and it is a complte new work from pocket mosters dimond and pearl. it dosent say rpg but there are little hints that say it is an rpg, like he says its got a new region and new pokemon so that must mean that its pokemon 5th gen rpg. please look at this page weekly for more info as it comes. the legandary pokemon phantom champion x's blacked out picture has been shown on pokemon super sunday this week. 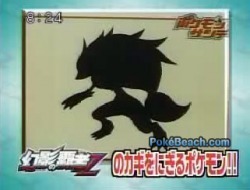 the pokemon is blacked out to make the viewers try to guess what the pokemon is. on the 21st febuary the pokemon will be fully revield but the latest issue of coro coro magazine might have further info. zorua is the pre evolution of the pokemon zoroark its debut movie will be pokemon phantom champion zoroark its part in the movie is still unkown. 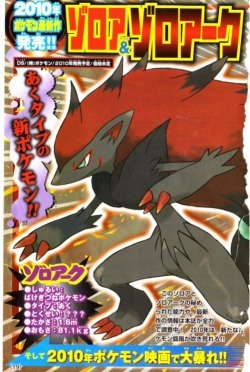 First announced on pokemon super sunday this next gen pokemon is the star of pokemon movie 13 phantom champion zoroark. 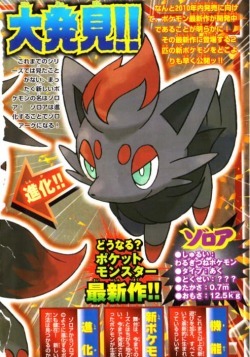 in the movie he is a pokemon that can change into DARK forms of other pokemon and PEOPLE. the location of this pokemon is yet unkown but he is catchable whithin the new games.Also as this pokemon couldnt be a legenary us at pokestation.com believe that two all new legandarys will be on the cover of the next gen games not zoroark.